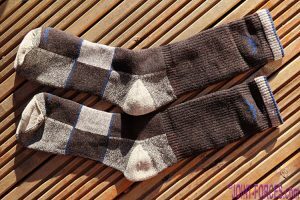 For regular readers you will know I have been using Darn Tough socks for a while now and have always found them to be very good indeed, writes Mike Gormley. This time both Jean and I have had a chance to use Hike/Trek sector Merino wool socks from this ever expanding range. As I write we will soon be off to get a few more miles in with these on the South West Coast Path. 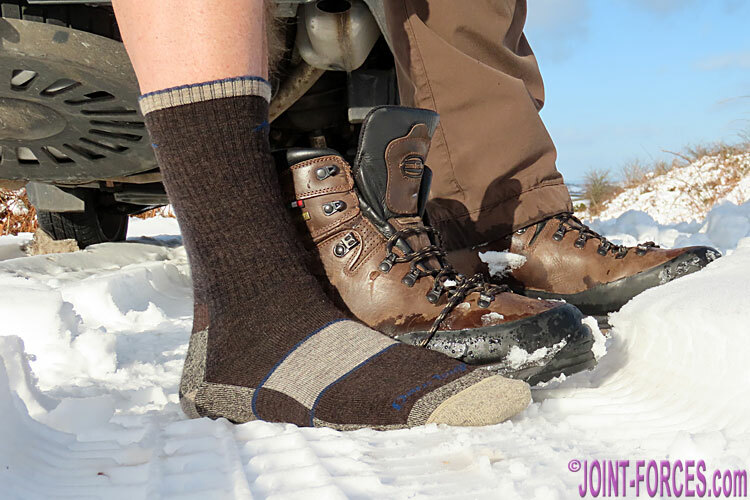 Last weekend we were able to put them to a good test on snowy Dartmoor. These socks do not actually look all thick and cosy, but I must say appearance is no gauge of their superb ability to keep feet warm and comfortable without the bulk which can sometimes make some socks a little discomforting. Being Merino-based they keep the foot warm and cool as appropriate and control moisture well. As with the other Darn Toughs I wear, I found they stayed up very well and so remained more comfortable and kept the lower leg warm where appropriate. The model I wore was the Hiker Boot Sock Full Cushion from the Men’s range and Jean trialled the Trail Magic Boot Cushion from the Ladies range. My socks are made of 66% Merino Wool, 32% Nylon and 2% Lycra Spandex, come in five colours – these are Chocolate – and are available in M, L & XL. Jean’s are 52% Merino Wool, 45% Nylon and 3% Lycra Spandex, come in two colours – these are Gray – and are available in S, M & L. Mine have full high density cushioning throughout the entire sock for full-on comfort and performance and Jean’s have mid-level cushion density under foot. Both are naturally antimicrobial, courtesy of the Merino, repelling bacteria and odour, and they ate constructed with trademarked True Seamless undetectable seam fusion for an ultra smooth, invisible feel. Whatever it is that Darn Tough do when they design and make socks, for my money they do it very well. Highly Recommended.